Sewing elastic can seem intimidating but it's not! Learn about the different types of elastic and how to use them with our sewing guide for beginners! If you're new to sewing, chances are you've probably heard of elastic and know that it's often used for waistbands and similar stretchy projects, but you may not know how to use elastic. That's why AllFreeSewing is here to save the day! From defining what sewing elastic is to explaining the different types of elastic that sewists use, our guide on How to Sew with Elastic is perfect for beginner sewists. We've covered all of the different types of elastic in our crash course on sewing so that you can make a comfortable waistband or add shirring with confidence. And if you aren't sure how to add elastic to a project, then don't worry, because we've included a list of tools that make inserting elastic into a sewing project a total breeze. Want to put your skills to the test? If you're looking for easy sewing projects that let you show off your elastic skills, then don't miss our list of beginner sewing projects included at the end of our article. Design comfortable and stretchy clothing for yourself and your family by following our guide for sewing elastic to fabric and other tips for working with this material. Plus! Do you love learning new tips and tricks about sewing? Then be sure to sign up for our free eNewsletter, Sewing It Up! Even if you've just begun sewing, you probably have seen elastic or know that it's commonly used in waistbands and other sewing projects that require the ability to stretch. But what actually is elastic? "It is a narrow fabric that stretches due to its composition. Rubber or spandex cores are wrapped in a fiber such as polyester, nylon or cotton and then woven, knitted or braided to create the elastic." The rubber core of sewing elastic allows the garment to spring back into shape after multiple wears, helping to lengthen the life of the clothing. It's important to remember that only recently was elastic used in mass-produced clothing. Although English inventor Thomas Hancock is often credited with inventing elastic, when he patented elastic fastenings for gloves and suspenders in 1820, elastic as we know it wasn't mass produced until after the 1920s. Not only does elastic help clothing retain its shape, but elastic waistbands are also a time-saving alternative to the button-covered clothing of pre-WWI. When you imagine the clothing of the Victorian and Edwardian era, it's easy to see the advantages of elastic over numerous buttons and ties. Are you a visual learner? Then you'll love this video on different types of elastic from blogger Angel Peterson! Follow along with Angel's video to learn about the different types of elastic most commonly used in sewing. Angel also discusses which type of elastic works best with certain sewing projects and discusses a few tools that new sewists need when working with elastic. There are numerous types of elastic available to sewists, with each having its own use and benefits. Some types of elastic, such as knit elastic are easier to sew with as opposed to braided elastic; others like elastic thread are good for shirring projects while other elastics are great for decorative projects, like hair bows. Our guide to elastics breaks down each common type of elastic used in sewing and discusses the benefits of sewing with each type. With our sewing guide for beginners, you won't have to worry about becoming overwhelmed on your next trip to the fabric store. Braided elastic is one of the most common types of elastic available to sewists. This form of sewing elastic tends to shrink when stretched, meaning it shouldn't be directly against your skin. Braided elastic cannot be sewn through and needs casing, meaning it's not as comfortable as other types of elastic. Braided elastic is ideal for casings, such as inside sleeve hems or swimsuits. Knit elastic is the most common type of elastic used for sewing clothing. When stretched, knit elastic remains the same width and can be sewn through without becoming damaged. This type of elastic is also soft against the skin and can be inserted into casings or used directly with fabric, such as with pajama pants. This type of elastic works best with lightweight fabric. Woven elastic, like knit elastic, does not shrink when stretched, although it is stiffer than knit elastic. While woven elastic can be sewn with, it is typically not comfortable to wear against the skin and is often used for bags or home decor sewing projects, like furniture coverings. Woven elastic is stronger than braided or knit elastic, and is ideal for heavier fabrics. Elastic thread is wound on a bobbin by hand and is most commonly used for shirring, a form of gathering fabric. Elastic thread can also be used to give clothing items, like scarves, additional texture. Fold-over elastic is ideal for finishing stretch fabrics and can be used for underwear and athletic wear, as well as accessories like headbands. Fold-over elastic doesn't fray and has excellent stretch, and often comes in a variety of prints and colors. Lingerie elastic is used to sew lingerie. It is typically a form of knit elastic and is designed to feel comfortable against the skin. Some lingerie designers also use stretch lace as a form of elastic. When it comes to sewing elastic or with elastic, there are a few handy tools for sewists available. For general sewing projects involving elastic, a ball point needle is often used, although this can vary depending on the type of fabric and elastic used. When inserting elastic into casings and pulling them through, there are two methods often used. The easiest and most budget-friendly option is to use safety pins to pull elastic through casings. You can also purchase tools designed to pull elastic through casings, such as bodkins or elastic threaders. If you're ready to start sewing with elastic, don't miss this list of easy sewing projects for beginners. They're quick and simple sewing patterns that are perfect for practicing how to sew with elastic! If you've conquered how to sew on elastics and with elastics but are still searching for some tips and sewing tricks for beginners, be sure to check out the following recommended reading! These books are a great jumping off point to explore the world of sewing even further. 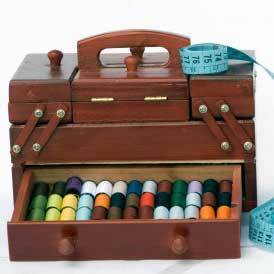 What other types of sewing tutorials would you like to see on AllFreeSewing? Let us know below in the comments! Great article with such informative information. I never realized there were so many different types of elastic! I'm new to sewing, so I definitely needed this article.